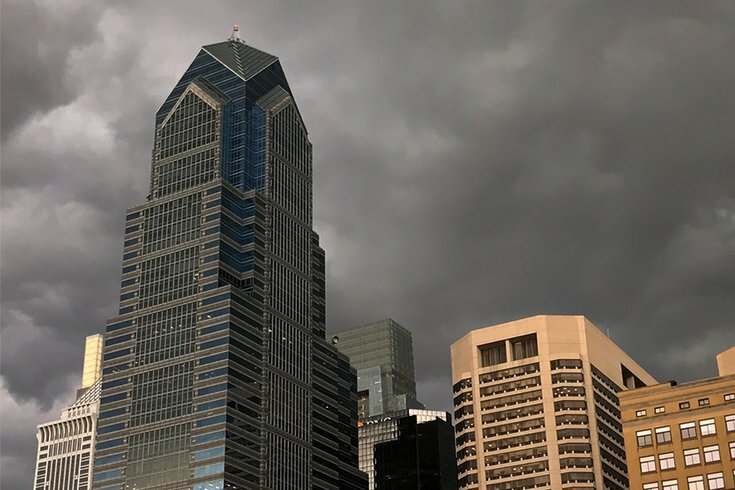 Storm clouds darken the Center City Philadelphia skyline late Tuesday afternoon. Severe weather was expected in parts of the region. Tuesday night’s storm truly ripped through the Northeast region. Swirling dark clouds rolled into Philly around rush hour, the wind picked up and ominous skies all pointed toward some bad rain on the way – which eventually began just after 6:15 p.m.
At 7:35 p.m., PECO reported about 9,700 customers without power, with the vast majority in Montgomery and Bucks counties. In New Jersey, PSE&G reported more than 40,000 customers without electricity, mostly in the central and northern part of the state. Nearly 1,500 Atlantic City Electric customers were without power as well. Flights on average at Philadelphia International Airport were being delayed 2 hours and 14 minutes, according to the FAA, which also reported similar delays at Newark, JFK and LaGuardia airports. The National Weather Service is calling for significant, severe weather threats tonight in southern New England and the northern Mid-Atlantic. Any real damage will wrap up Tuesday night in our area — and in northern New England some flash-flooding could continue into Wednesday. But this rain could linger for the next few days. In places like D.C. (which was hit the hardest last night), New York, Connecticut and New Jersey, authorities are dealing with the aftermath like traffic, flooding and wind damage. Here are some images of the storm that have been posted to social media in the Philadelphia region and beyond. And then there’s this terrifying time lapse of the New York City skyline.